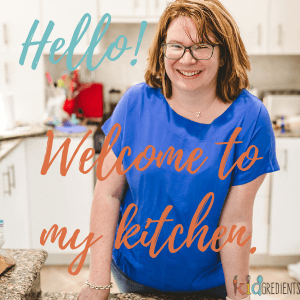 You are here: Home / Recipes / Freezer Friendly / Sweet Potato Gems, yummy tater tots! Wow! This post was from May 22, 2015 and has just been updated with brand new photos! 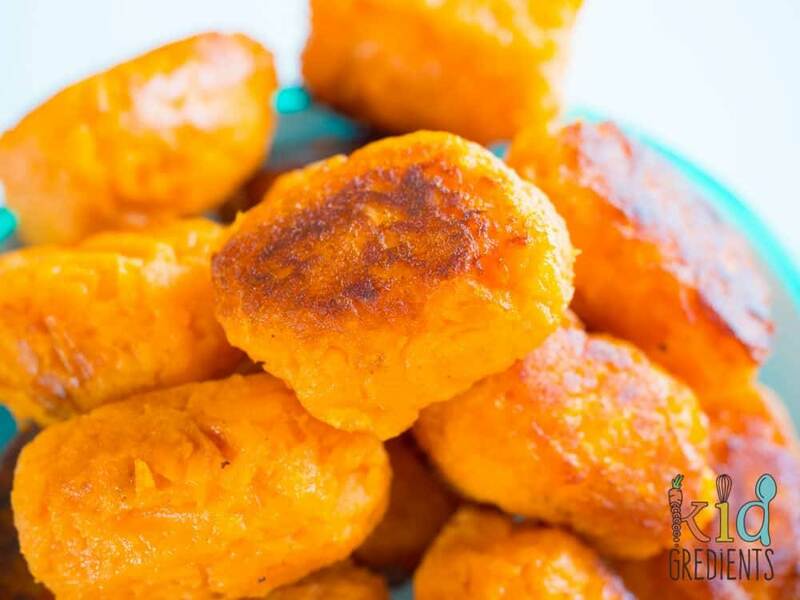 We love sweet potato gems, they are a favourite and we think you need to try them. (Out of the mouth of Miss 7). These are dairy and egg free, so the perfect side for allergy kids. Swap out the plain flour for rice flour…and they can be gluten free too. Sweet potato gems, tater tots whatever you want to call them are not good for you. They are a processed convenience food sold in the freezer aisle of a supermarket. They taste very good though. Very, very good- I know because I remember them quite well from my childhood. So what if I told you that you could make them at home with no numbers, no icky oils used and no strange ingredients? What if I then went one step further and we made them with sweet potato rather than potatoes so as to make them even tastier? 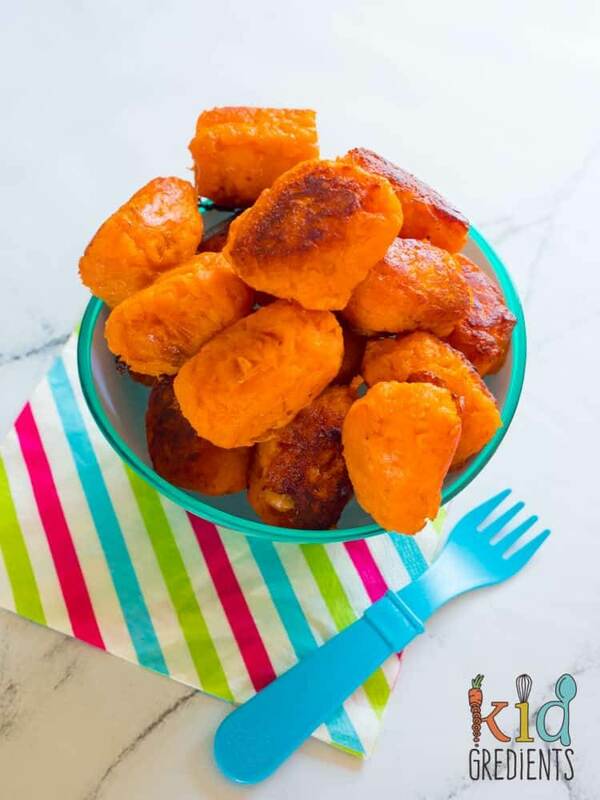 Sweet potato gems. They are real. So, doing research for the making of potato gems I came across this recipe. I decided to make them using sweet potato and some of the herbs and spices that I know work well with sweet potato. I’ve followed pretty much the method from the recipe I’ve linked to, but adapted it to work with sweet potato. The reason I loved this recipe so much was because it actually just uses a grater! Even though I got a potato ricer for my birthday last month, I know that many of my readers would switch off at the words potato ricer. If you’re looking for a way to replace these types of convenience foods, then I’ve got you sorted! Let me know by leaving a comment below if there is another convenience food I can help you to replace with a real food alternative. Make sure you check out our other sweet potato recipes like this amazing sweet potato and zucchini strata bake and these sweet potato and choc chip muffins! These were very popular with all Kidgredients tonight, including a tired and cranky Master 2 who didn’t really feel like eating! 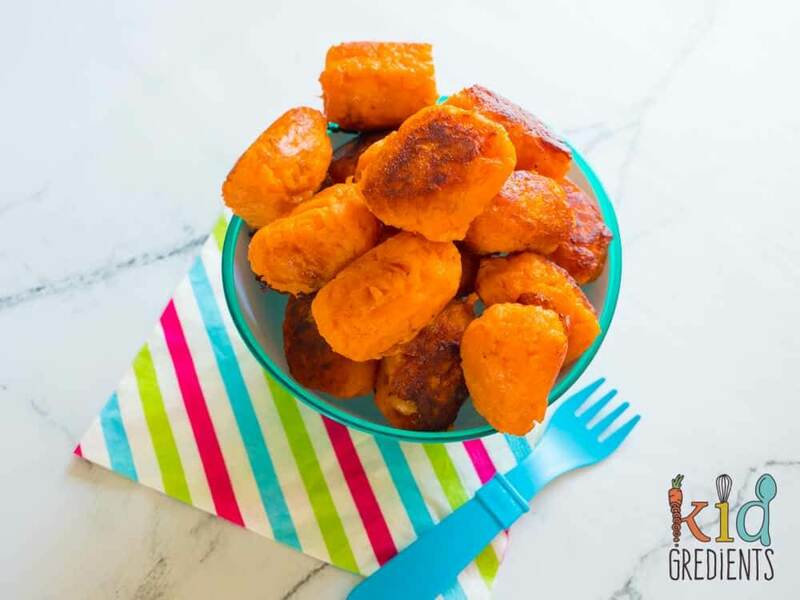 We love sweet potato gems! Much healthier than store bought and so yummy! Put the chunks of sweet potato in a large saucepan and cover with cold water. Bring to the boil then cook for 8 minutes. Drain the sweet potatoes and rinse in cold water until cool. Grate the sweet potatoes using a cheese grater. Gather the grated sweet potato in a clean tea towel and squeeze out excess moisture. Add the sweet potato, flour, sage, cinnamon and nutmeg to a large bowl and mix well. Shape 1.5 teaspoon mounds into little logs. Heat oil over high heat in a frypan. Fry the logs in batches until golden on all sides- 4-5 minutes per log. COOK: preheat oven to 220 degrees and bake for 10 minutes or until crunchy. FREEZE: freeze after frying and reheat in a 220 degree oven for 15-20 minutes. Previous Post: « Nut free chocolate bliss balls… no desiccated coconut! Thanks for your recipe. I was looking for a way to use up some leftover sweet potato mash, plus some roasted vegetables and I decided to modify your recipe. I mashed up the cold caramelised onion, roasted celery, roasted carrots and steamed cauliflower and mixed it in with the mashed sweet potato. Then I added some flour and followed your directions. They were a bit hit with our kids, despite that they’ve never actually eaten tater tots before (they aren’t sold here in Australia). I never liked the potato gems from the supermarket, they taste like soap to me. Thanks so much for linking up with #justanotherlinky Hope too see you again Sunday! This looks great. I love doing this at home that taste better than the processed stuff. Mr Kidgredients won’t eat quiche, but I’ve got a cracker recipe I can put up in a few weeks! 🙂 let’s solve your quiche problems! Awesome! I found you through the link up party – the ultimate rabbit hole – am looking forward to looking around your blog. I blog about family eating as it related to my core business of providing healthy eating classes to children. I mostly work with fussy eaters in Sydney. 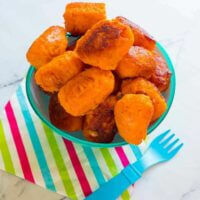 I will try these sweet potato gems with the rice flour – sounds great! These look amazing! I love potato gems, well anything potato really. I’ll have to try these to go with dinner one night this week. So do I! A major favourite around here. Thanks for having me! We love sweet potato and cinnamon! Look amazing, can’t wait to try them! Loved potato gems at school. So did I! I love trying new ways to make retro faves! I think steam first….then blitz? Oh they sound divine! I have got to try these. Great blog by the way! I think I might need to try these, Kylie. I have a stack of sweet potatoes as they are really cheap at the moment. And also thanks for the freezing and reheating instructions too. Just reporting back…I made these last night (as one of the vegetable components to go with our roast, because I couldn’t wait any longer to make them) and I’m embarrassed to say that I didn’t pay close enough attention when the sweet potatoes were cooking and I over-cooked them. I still followed the whole recipe through, but because of my stupid mistake they were more like croquettes than gems. On the plus side, everyone liked the flavour, my husband took the leftovers to graze on at work tonight, and I’m looking forward to trying again without over-cooking the sweet potato. It’s normally me that does stuff like that! Glad the flavour worked!